I've been thinking about upgrading from my $1.99 black mini stretch gloves to a pair of quality leather ones for some time now, but unwilling to shell out the $50+ to do so. My thoughts turned to the brown leather gloves that used to belong to my mom, the ones that were sitting in a box full of discarded ratty mittens and gloves in the coat closet downstairs. They fit well when I tried them on. The leather was soft, supple, the colour of roasted espresso beans. The inside of the gloves was lined with a combination of wool and fur (real or faux, I can't tell). 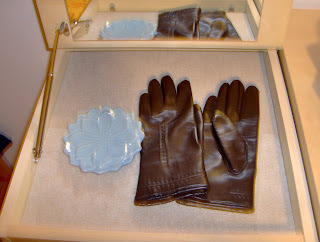 I was very excited about having vintage leather gloves that were in great shape--for free. Gleefully, I ran up the stairs to where my mom was in the kitchen and said, "Mom, look!" She looked. "Did you buy these?" She looked again. "Oh, they are!" "I bought them in 1980--or was it 1981?--when I first came to Canada and your great aunt took me to the Eatons downtown and said I needed to buy gloves for winter. They were the nicest ones being sold there and they cost twenty-something dollars. Your great aunt insisted the leather would loosen as I wore the gloves and I should anticipate that, so I purposely bought them too small thinking that they'd stretch. I'd never worn gloves before in my life--I didn't have to in China--let alone leather ones, so I didn't know any better. I bought the gloves and ended up never wearing them because I couldn't even get my hand into them, they were so tight! I didn't know you could get refunds and exchanges at the stores here, and I didn't know any English, so I didn't even think to bring them back. I just swallowed my pride and accepted that I was stuck with them, and then I packed them away and forgot about them. They fit you, though; you should wear them." Her story amused me to no end as an endearing immigrant anecdote and as a valuable lesson. Even as a young woman with little money in a new country, she had an eye for good quality, prefering to spend a bit more on an investment item rather than a cheap thrill. And even though she didn't ever wear the gloves, one generation later, her daughter is coveting them and stealing them from her wardrobe. Thats a wonderful story! It's so nice that they fit you too. My mom had all kinds of great leather boots/shoes I wish I could wear but my feet are too big. She did pass on a couple of gorgeous vintage gowns... ~sigh~ but I haven't had the occasion to wear them yet! Lucky you! I wish I could find stuff like that in my mom's cupboard. I couldnt tell they were so old - they look great! that's a lovely story! =) it's so sweet of your mum to pass the gloves on to you... i love clothing items that have a story behind them.